When you learn Java or any other programming language you usually start by looking at the basics of the type system and how the arithmetic operations work. You learn how numbers are represented and what types of numbers your programming language offers to you. "In Java, only safe implicit conversions are performed: upcasts and promotion." "Implicit type casting occurs only in the case of widening conversion or up casting." So, let’s focus on a non trivial and non safe conversion. Let’s say that we have an expression with type double and we want to assign the result to a long variable. There is no way the compiler can figure out automagically, in a safe way, how to convert a decimal number into a integer number without potentially losing some information. That’s clear, right? "A conversion from type double to type long requires a non-trivial translation from a 64-bit floating-point value to the 64-bit integer representation. Depending on the actual run-time value, information may be lost." The reason why this is not going to compile is because when you do (b = a * b) you are losing precision and that requires an explicit cast. We have also learnt that you can write b = a * b in a more concise way by writing b *= a. The operator *= is a Compound Assignment Operators and most of the people (including me) understand that as a nice “syntactic sugar”. So let’s try to rewrite our fragment using the operator *= . Did you see what happened? OMG! The code just compiles! It does not just compile, it is also not going to fail in runtime and is going to lose precision silently. 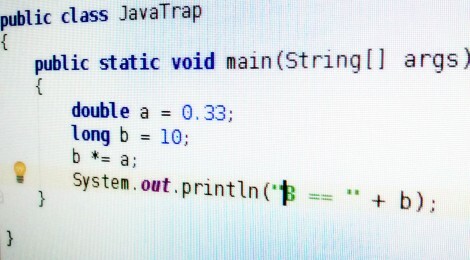 So, if you were not yet aware, be very careful with the primitive Java type system. Happy coding!